This story was prepared (and updated) with the help of Racer Rowing Vice President, Danielle Eichelberger. Thanks, Danielle for spreading the news about the team’s plans for an exciting new event! With an especially creative plan for fundraising, Racer Rowing is planning its first ever Cardboard Regatta. 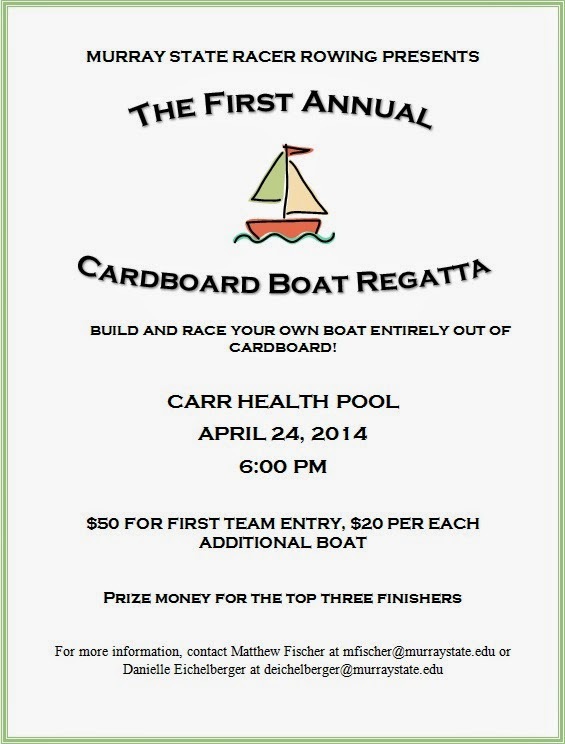 On April 24th at 6 P.M., teams from all over Murray State will be racing handmade boats constructed entirely of cardboard. The contest will take place in the Carr Health Building pool. Teams representing Greek life, residential colleges, academic departments, and student clubs will be on hand to see, not only if their boats can cross the finish line the fastest, but whether they can stay afloat! that sinks the most spectacularly. If it is successful, Eichelberger said the Cardboard Regatta may become something that the team does annually. Stay tuned to The Racer Rowing Society Blog for photos and updates regarding Racer Rowing’s first ever Cardboard Regatta!